In some cases, the doctor may need to switch to an open surgery . A wide incision in the abdomen will be made to do the surgery. 7/30/2012 DynaMed's Systematic Literature Surveillance http://www.dynamed.com/topics/dmp~AN~T116914/Gastroesophageal-reflux-disease-GERD : Niebisch S, Fleming F, Galey KM, et al. 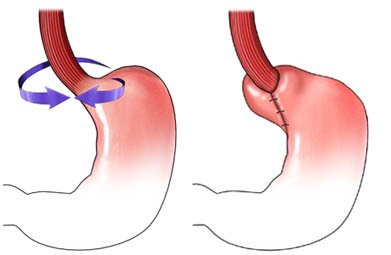 Perioperative risk of laparoscopic fundoplication: safer than previously reported—analysis of the American College of Surgeons National Surgical Quality Improvement Program 2005 to 2009. J Am Coll Surg. 2012;215(1);61-68.